“Were Your Favorite Teams Favorite Team"
So lately i have heard lots of questions like: "how can I get my DRL's to stay on when my headlights are on?" or "how can keep my low beams on when I switch to my Highs?" I know that many members on this site already know the answer to this question, but there are plenty of new people who do not. I figure it would be nice to places that lists all the different options and how to perform them. Disclaimer: I will not take any responsibility for any unforeseen issues that may result from someone performing these modifications. Also some of these modifications may be illegal, check your state laws. 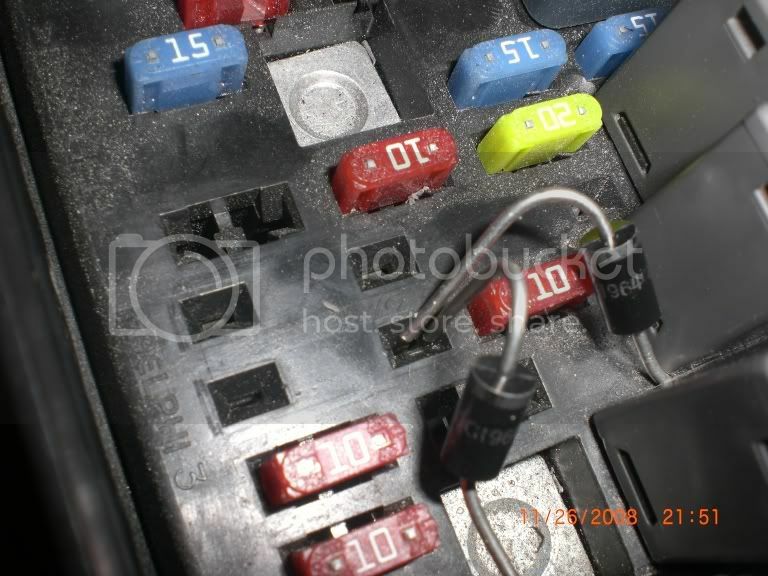 The simplest way to add more light to your vehicle is to do a Diode Mod. There are other ways to perform these modifications, but these are the cheapest and easiest and I have done some of these modifications without any issues. First you need to purchase a diode from Radio Shack or any other electronic store. 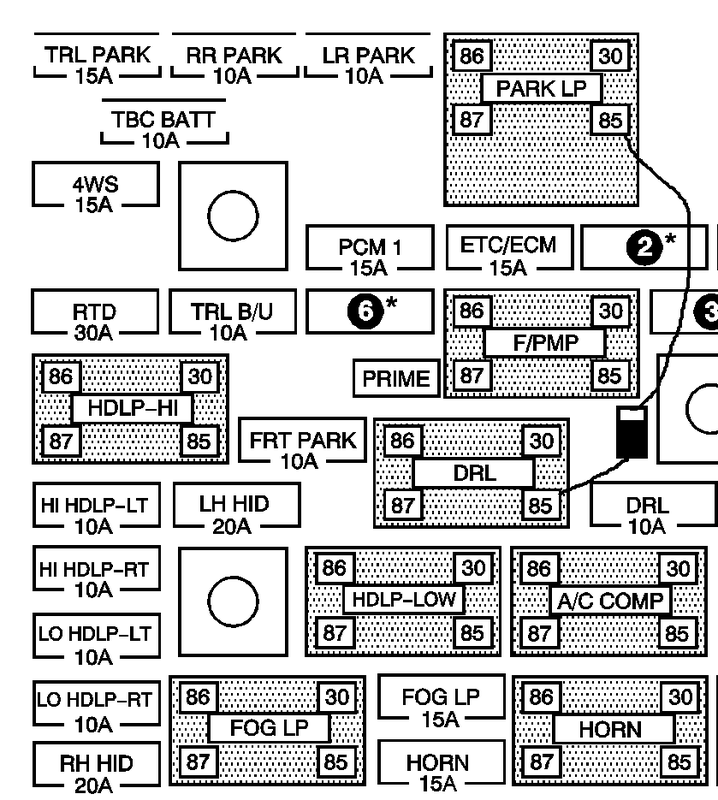 Radio Shack part numbers 4001, 4002, 4003, and 4004 will all work, and they usually come in a 2 pack for about $1. It hink i used a 50v 3W diode, but im not 100% sure. A diode is a super simple electrical device that allows current to flow one direction but not the other. Diodes either have one end that is a different color have a line painted on one end. 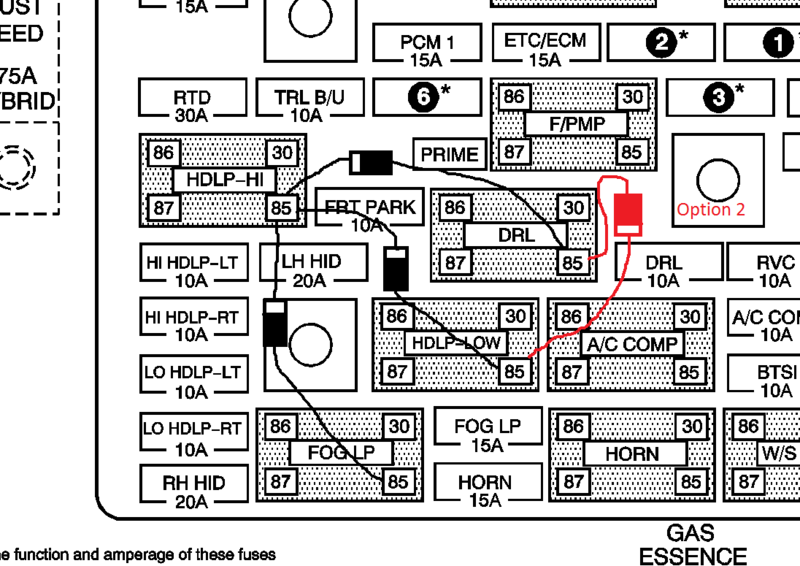 It is very important that you have the diode lined up correctly or it wont work (Follow the diagrams). 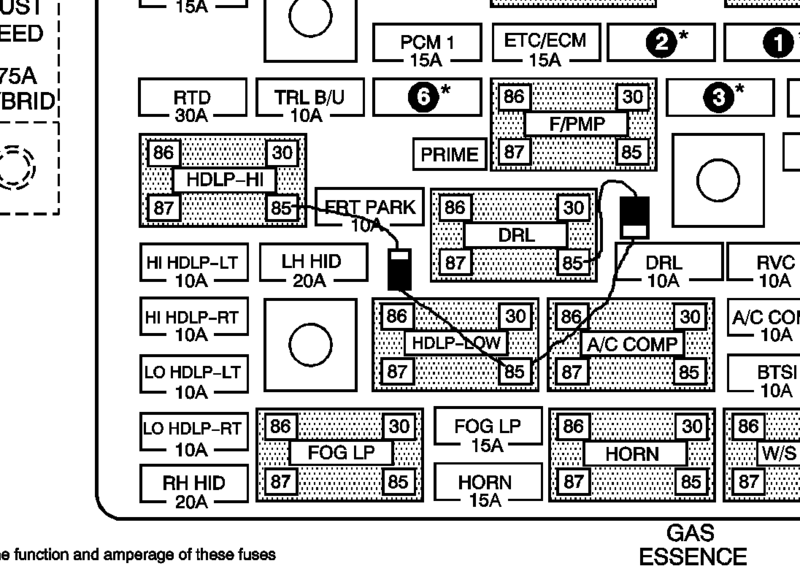 For example if you do the 4-High mod listed below you want to makes sure the diode is set so the current flows from the high to the low, which triggers the low beams to come on with the highs. If you hook it up wrong it will have your highs come on with your lows which is a no no. You can also buy some heat shrink to protect the Diode but it is not necessary. Then you are going to want to located the fuse box under the hood of your truck, and located the relays you will need to pull based off of which mod you want to do (see diagrams below). 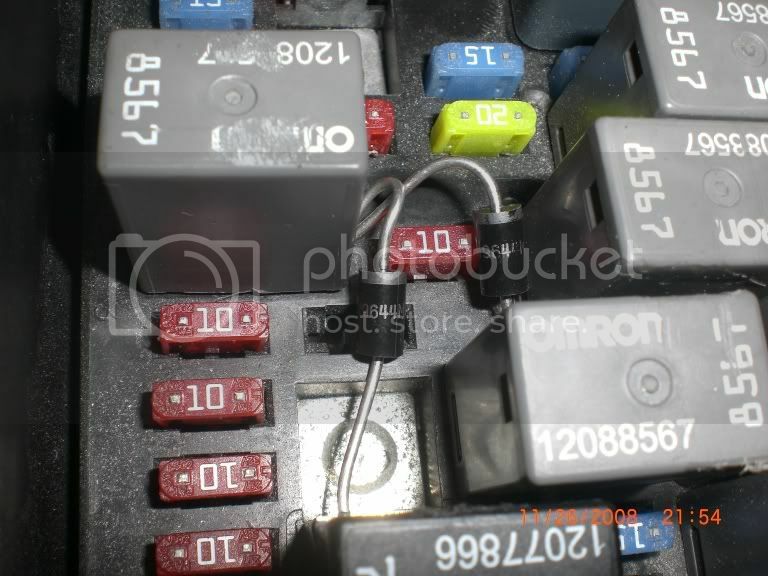 And make sure you located the 85 pin on the relay. You just need to simply removed the relay and place one end of the diode into the hole for the 85 pin Then plug the relay back in. Then put the other end of the diode into the 85 pin of the other relay. Which relays you use are different depending on what modification you want to do (See diagrams below). Some people have also soldiered the diode to the 85 pin of the relay, but I don't think it is necessary and you risk screwing something up. Some have had issues with there diode coming loose, but I had this mod for 6 years in my SS with no problems. Here are some Diagrams showing the different modifications you can do. I will add more if needed and I will try to get up a couple pictures that show the lights lit up. If you have HIDs or are planning on adding HIDs I highly recommend that you do this mod. HID's have a bad habit of taking a couple seconds to heat up and come up to full brightness (especially when its cold outside). The last thing you want to do is switch back to your lows after having your highs on for a long time and not be able to see. This happened to me and I almost ran off the road, the next day i did this mod. This will allow your Daytime Running Lights (DRL's) to stay on when your headlights come on. You can also run the diode the opposite way and make it so your lows stay on all the time. There are also other ways to go about that mod, but Im not sure how. This will allow you to have your fog lights automatically come on when your low beams come on. Warning: In Oregon you are technically only allowed to use your fog lights in low visibility (Fog, snow, heavy rain), and technically you are suppose to turn of your fogs when you approach an oncoming vehicle (just like with your highs). Check your states laws. This mod is usually illegal since your only allowed to have a total of 4 lights on at anytime. 6-High Mod. Highs Lows and DRLs are on when you turn your highs on. This is also illegal, but not even close to being as bright as the Highs/Lows/ Fogs mod. 6-High Mod. Your DRL's stay on with your Lows, and your Lows stay on with your Highs giving you 6 lights. 6-High Mod. Your Fog lights stay on with your lows, and your lows stay on with your Highs giving you 6 lights. Do you really need to do this? Extremely bright and Highly Illegal. If any others have done other modifications like this let me know and I can create a diagram and add them to the list. Here are some pictures of the Diodes installed. I found these on the internet and they show the 6-high mod with the lows, highs, and fogs when the highs are on. Nice work bud! I already have this done on my truck but now I can reference people to a how to. 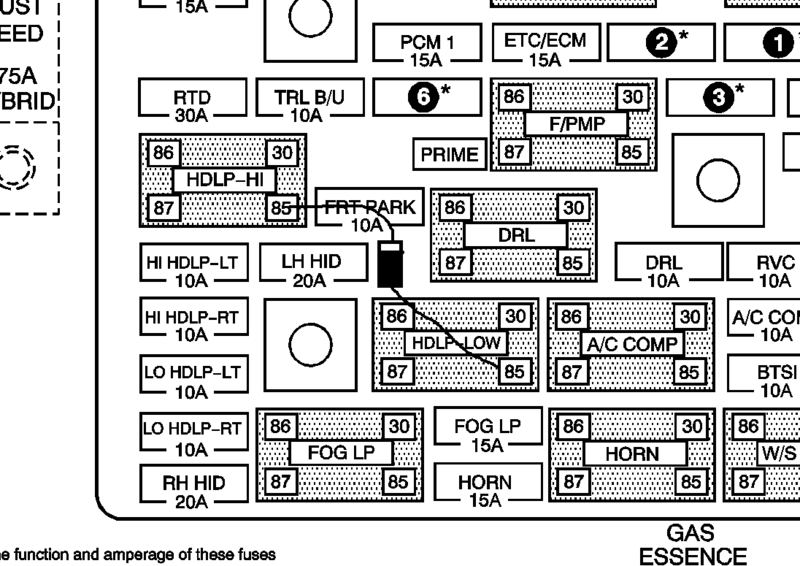 Is it possible to switch on the both tail light 7w of 21/7w bulb ( upper(light/brake) and middle(blink) 7w bulb) ?? i have just the 7w upper and lower little bulb , it's not very lightning i think , i know i must change the middle(blink) soket bulb , but i don't know how to make deviation(deflection) wire ???? Somebody have an idea ???? Wow, what an awesome write-up. I did the Lows on with Highs today. I really like it. I also changed out the DRL bulbs for ambers, I'm digging the all amber bottom. I have an update for the DRL on with Parking Lamps. It is pictured incorrectly. 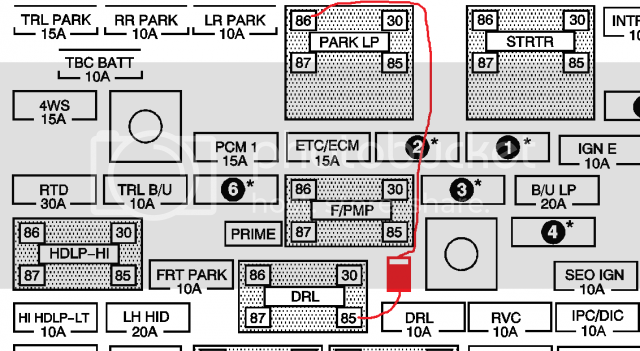 It is shown as Pin 85 Park LP to Pin 85 DRL. It should be Pin 86 Park LP to Pin 85 DRL. I verified this on my truck because 85-85 did not work and I was about to pull all my hair out. So after much grunting and checks with the handy-dandy multimeter, I found Pin 86 Park LP to be the pin needed. Hooked it up this way and it works flawlessly. Thanks for the update. I never actually tried the DRL with the parking light so I just assumed it was the same as the others..